See the links at the bottom of this review for video clips of Wolf Creek from Facebook and You Tube, including a flyby and interactive golf challenge, plus online tee specials. Click here or contact Golf Wolf Creek Vacations (866) 251-4653 for information on Wolf Creek Stay and Play Packages (other area courses also available including Sand Hollow in St. George, Utah). Wow! Walk out on the patio outside the clubhouse at Wolf Creek and stare down at hole number one... a signature hole right off the bat. Don't worry, there are 17others. No matter how many times you click your heels together or pinch yourself, this vision will not go away - you certainly are not in Kansas anymore! 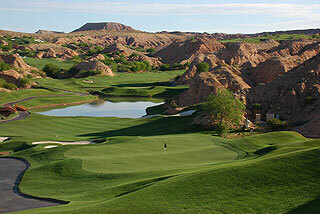 Wolf Creek in Mesquite is truly one of the nation's premier golf experiences. Anyone playing golf in Vegas, who has not taken the 1 hour trip out to play this spectacular layout - is missing out on a lifetime golf opportunity. Respected golf publications have put this course in the same class as Pebble Beach and Pinehurst. 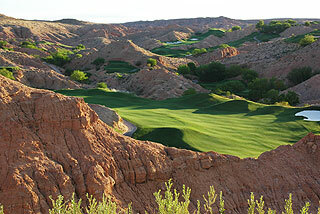 In fact, Golf Digest and Golf Magazine have listed Wolf Creek as the best new course in the nation - two years in a row. Folks, play it now! 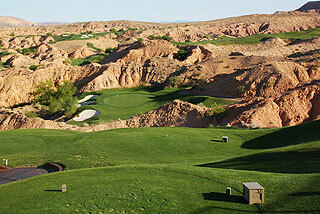 Seasonal rates range from $85 to $195 - it is one of the best deals in the country... if it were closer to Vegas, Wolf Creek would be getting $250 plus per round, and may eventually reach that plateau anyway... deservedly - it is that good. Golf buffs who would travel across country and dish out nearly $300 for an opportunity to play Pebble Beach, are certainly getting a bargain here. And the ordinary person can book a tee time here quite easily. The grounds at Wolf Creek are also impressive. A putting green and grass range (for irons only) is complimentary to guests. A modern golf shop features classy Wolf Creek logo attire as well as a full selection of golf accessories. A dining area that can accommodate up to 80 people serves up a nice fare, and the bar/lounge features perhaps the "best golf view" of any clubhouse in America. This is a great place to eat, drink, relax and hash over the day's experience. 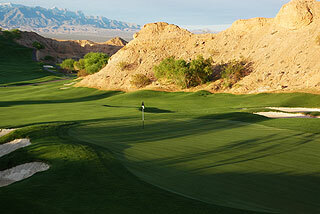 The outdoor patio is spacious, with incredible panoramic views of the course and surrounding desert mountains. It is obvious that the employees love being here, as they are eager to make your visit enjoyable. The 77 mile trip from the Vegas Strip is a quick one, with a speed limit of 75 nearly all the way, once you pass the outskirts of town. There is little traffic, and the course is located just a couple minutes west of the second Mesquite exit. With cheap and efficient car rental available nearly everywhere in Vegas, it is certainly worth it to pick up your own transportation for a day. 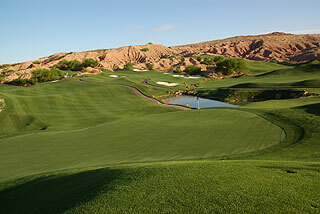 While Wolf Creek is worthy of a trip to Mesquite for an individual round - you should also know that there are 99 holes of top quality championship golf available here (Falcon Ridge, Oasis/Vistas, Palms and Casablanca golf clubs also) - all within a five to seven minute drive of a variety of full service casino resorts. Throw in the Coral Canyon and Entrada courses in St. George (40 minutes north of Mesquite), and you have what the Two Guys Who Golf consider to be the nation's top intimate golf destination! 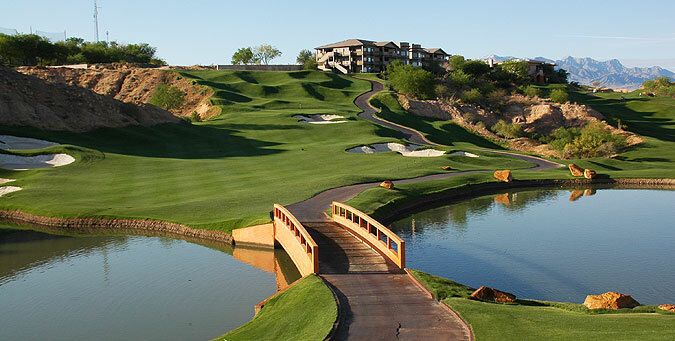 At the end of this review you will find links to the Wolf Creek website, Two Guys Who Golf informational page on the course along with other courses and accommodations, and contact numbers for those wishing to plan a trip. A day trip, long weekend or an extended golf holiday are highly recommended! There are 5 sets of tee boxes at Wolf Creek (6994, 6436, 5820, 5247 and 4169 yards), with the slope rating ranging from 154 to 125. For the average golfers and first time visitor, we recommend you move up one tee from your average choice...this is a tough course with some tricky carries and pin placements. At 5820 yards, the Masters tee boxes provide challenge enough (slope of 135), while also allowing for a chance at success. You definitely want to be on the correct portion of these beautifully conditioned putting surfaces, which are frequently ridged or double tiered. Sprinkler heads are marked, and are found easily all over the fairways. Despite opening up for the 90 degree rule (Wolf Creek used to be cart path only when it initially opened), the course was in outstanding condition from tee to green on our visit. The opening hole affords the opportunity for a good start, as it plays from an elevated tee area to a generous fairway. The approach narrows with bunkers on both sides of a green tucked between rock outcroppings. The par four second is the course's number one handicap, bit is a do-able hole if you can get some distance and accuracy off the tee. Greenside bunkers short left and long right, along with a two-tiered putting surface are the obstacle to par here. You will need two clubs extra on the tremendously uphill par three 3rd, which precedes one of the easier holes of the layout. The fourth provides an ample landing area on the left, which provides the best vantage point for reaching the small, bowl shaped and noticeably undulating green. Players from the top tees will have a difficult tee shot on five, as you must carry the mountains without driving your ball through the narrow fairway. It is difficult to cut too much off from the Challenger and Champion tees. From the lower tee boxes, this is can be easy hole. Aim over the foothills left of the fairway bunker and you may have a short iron/wedge approach and a possible eagle opportunity. A lay up off the tee is the preferred play on the dogleg right par four sixth. Wolf Creek crosses about 130 out, and the approach is uphill. Another strategic lay up is called for on seven, which features a layered fairway. The approach, which demands a carry over a water hazard, may be anything from level to severely uphill depending upon how much distance you cover off the tee. A 200 yard tee shot from the Master tees will leave the most advantageous positioning. 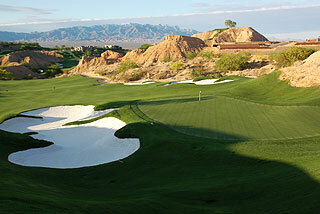 The Par three 8th plays a whopping 248 yards from the tips, and is challenging enough from the mid tees at 152 yards. There is no room long or left for error. The only possible bailout on this absolutely gorgeous hole is short right, as the Wolf Creek winds its way all around the hole. The closing hole on the front is a short par four with a carry over water necessary of the tee. There are fairway bunkers on both sides and the uphill approach is tight. The back side plays a bit longer and features water hazards on 3 of the first 4 holes. Ten presents a narrow fairway that slopes right to left, towards the bunkers. The approach is even tighter. From an elevated tee, you will appreciate the surrounding vistas on number eleven. Take one club less to reach on this pretty par three. Another elevated tee on 12 leads to a narrow fairway with desert canyons to the right and water left. At 554 yards, it is one of three 550 yards plus par fives on the course. A third consecutive elevated tee area awaits on 13. A shot placed on the fairway in front of the bunker on the left will leave a good lie to a well bunkered putting complex that plays extremely uphill. Four in a row - you guessed it - an elevated tee on 14 provides a great view of the fairway that bends left around six traps that serve to prevent slightly offline tee shots from reaching the desert. Reaching in two is a chore here, as the approach plays extremely uphill. 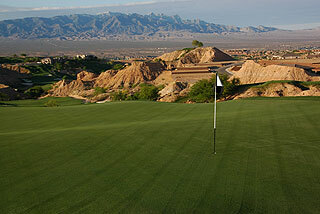 A simple downhill par three on fifteen is followed by a carry over a desert ravine off the tee on the par four 16th. The green is well guarded by bunkers, and "long is gone" here. 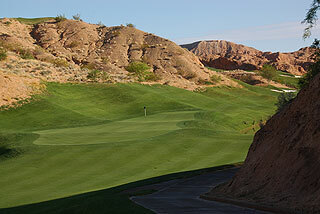 The gorgeous fairway on 17 lies between desert canyon walls, with a water hazard left and Wolf Creek posing dangers. The second shot must navigate the creek, which is about 160 yards out, and the approach bends to the left over another hazard. There are many ways to get your ball wet on this beauty of a golf hole. A tee shot over a grass ravine to a wide fairway confronts you on the final tee. The approach is uphill to a two-tiered green with bunkers short right. Take enough club and figure in the wind here. A good finish is quite possible. Wolf Creek, while tough, is not brutal. It is a challenging experience the first time around, but one can see that with repeated play, course knowledge would help with club selection and management. It is important to choose the correct tee boxes. This course is too beautiful not to enjoy! Tell them the Two Guys Who Golf sent you!